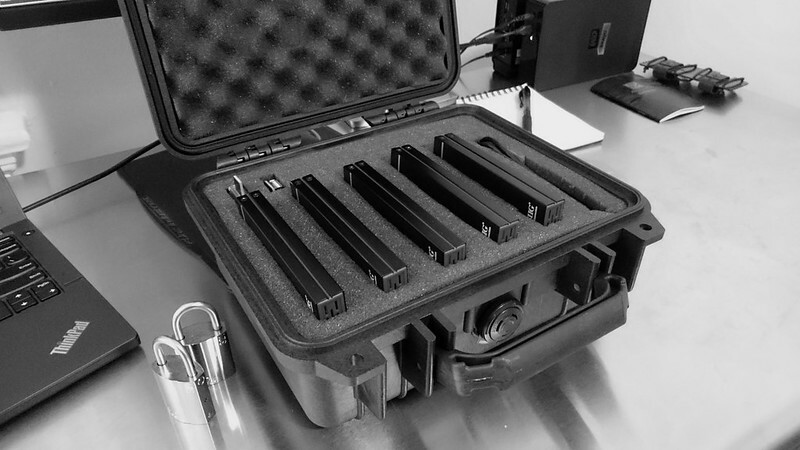 This past spring I mentioned my cold storage setup: a number of encrypted 2.5” drives in external enclosures, stored inside a Pelican 1200 case, secured with Abloy Protec2 321 locks. Offline, secure, and infrequently accessed storage is an important component of any strategy for resilient data. The ease with which this can be managed with git-annex only increases my infatuation with the software. I’ve been happy with the Seagate ST2000LM003 drives for this application. Unfortunately the enclosures I first purchased did not work out so well. I had two die within a few weeks. They’ve been replaced with the SIG JU-SA0Q12-S1. These claim to be compatible with drives up to 8TB (someday I’ll be able to buy 8TB 2.5” drives) and support USB 3.1. They’re also a bit thinner than the previous enclosures, so I can easily fit five in my box. The Seagate drives offer about 1.7 terabytes of usable space, giving this setup a total capacity of 8.5 terabytes. Setting up git-annex to support this type of cold storage is fairly straightforward, but does necessitate some familiarity with how the program works. Personally, I prefer to do all my setup manually. I’m happy to let the assistant watch my repositories and manage them after the setup, and I’ll occasionally fire up the web app to see what the assistant daemon is doing, but I like the control and understanding provided by a manual setup. The power and flexibility of git-annex is deceptive. Using it solely through the simplified interface of the web app greatly limits what can be accomplished with it. With the drive encrypted, it can then be opened and formatted. I’ll give the drive a human-friendly label of themisto. At this point the drive is ready. I close it and then mount it with udiskie to make sure everything is working. How the drive is mounted doesn’t matter, but I like udiskie because it can integrate with my password manager to get the drive passphrase. With the encryption handled, the drive should now be mounted at /media/themisto. For the first few steps, we’ll basically follow the git-annex walkthrough. Let’s assume that we are setting up this drive to be a repository of the annex ~/video. The first step is to go to the drive, clone the repository, and initialize the annex. When initializing the annex I prepend the name of the remote with satellite :. My cold storage drives are all named after satellites, and doing this allows me to easily identify them when looking at a list of remotes. $ git annex init "satellite : themisto"
Whenever dealing with a repository that is bigger (or may become bigger) than the drive it is being stored on, it is important to set a disk reserve. This tells git-annex to always keep some free space around. I generally like to set this to 1 GB, which is way larger than it needs to be. $ git config annex.diskreserve "1 gb"
I’ll then tell this new repository where the original repository is located. In this case I’ll refer to the original using the name of my computer, nous. If other remotes already exist, now is a good time to add them. These could be special remotes or normal ones. For this example, let’s say that we have already completed this whole process for another cold storage drive called sinope, and that we have an s3 remote creatively named s3. Trust is a critical component of how git-annex works. Any new annex will default to being semi-trusted, which means that when running operations within the annex on the main computer – say, dropping a file – git-annex will want to confirm that themisto has the files that it is supposed to have. In the case of themisto being a USB drive that is rarely connected, this is not very useful. I tell git-annex to trust my cold storage drives, which means that if git-annex has a record of a certain file being on the drive, it will be satisfied with that. This increases the risk for potential data-loss, but for this application I feel it is appropriate. $ git annex trust . The final step that needs to be taken on the new repository is to tell it what files it should want. This is done using preferred content. The standard groups that git-annex ships with cover most of the bases. Of interest for this application is the archive group, which wants all content except that which has already found its way to another archive. This is the behaviour I want, but I will duplicate it into a custom group called satellite. This keeps my cold storage drives as standalone things that do not influence any other remotes where I may want to use the default archive. $ git annex groupwanted satellite "(not copies=satellite:1) or approxlackingcopies=1"
For other repositories, I may want to store the data on multiple cold storage drives. In that case I would create a redundantsatellite group that wants all content which is not already present in two other members of the group. $ git annex groupwanted redundantsatellite "(not copies=redundantsatellite:2) or approxlackingcopies=1"
With everything setup, the new repository is ready to sync and to start to ingest content from the remotes it knows about! However, the original repository also needs to know about the new remote. The same is the case for any other previously existing repository, such as sinope. This post was published on 2016-08-26 . It was tagged with backups, linux, annex, crypto.